Buyers looking for a home in between November and February have either waited through the busy real estate season in hopes of a better deal, or are in a time crunch and looking to buy a home quickly. Nothing that winter will bring like bad weather or holiday preparations will stop these buyers from house hunting! If your home is available for them, they are more likely to make an offer close to listing price. Due to the misconception that winter can be a hard time to sell houses, there are less listings out there and thus more buyers looking at your home! Serious buyers have fewer homes to choose from over the holidays and will appreciate a home that is competitively priced and in top-notch showing condition. Internet surfing in general during the holiday season increases. The same concept applies for online house hunting and real estate browsing. Many home buyers devote a larger portion of their house-hunting time during the holidays to searching online, as opposed to seeing homes in person. To have your home discovered during this timeframe, it must be on the market. Homes advertised correctly online during the holidays get significantly more exposure than at other times during the year. 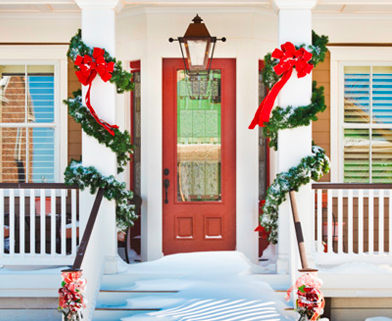 Your home can look more inviting and more appealing during the holidays. Whether it’s the red, orange, and yellow fall foliage beautifying your yard, or classic Christmas or Hanukah decorations, everyone loves the festive feeling holiday décor brings! Contact us if we can answer any questions for you about why NOW is the best time to buy or sell your home. As the holiday season gets underway, we wish you all the best from the Jennifer Vick & Co. team! Happy Holiday Season from the Jennifer Vick & Co. Team! Let us help you with your real estate needs this year!